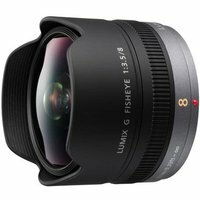 The Panasonic 8mm f3.5 Lumix G Fisheye Micro Four Thirds Lens offers a diagonal angle of view of 180-degrees, creating a distinctive perspective and unique distortion effect. This unusual "fish-eye" effect can be exaggerated still further thanks to the lens' close focusing distance of just 10cm. A sheet filter such as a gelatin filter can be inserted in the rear of the unit for even greater creative options. The Panasonic 8mm lens compromises 10 lenses in 9 groups including an ED lens to minimise chromatic aberration and distortion, while 7 blades give the aperture a rounded shape that produces an attractively smooth effect in out-of-focus areas when shooting at larger aperture settings. The Panasonic 8mm f3.5 Lumix G Fisheye lens also features a highly reliable metal mount and a stepping motor that makes the focusing action smooth and silent for use in both photo and movie recording.